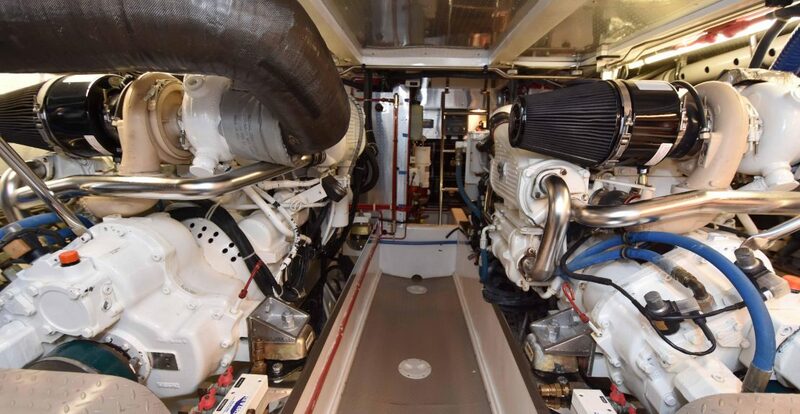 A very well equipped and well maintained Fleming 55 with Cummins QSC 8.3 500 hp engines. 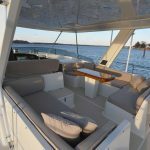 Features (2) Onan generators, Naiad stabilizers, Sidepower bow & stern thrusters, Furuno electronics & NavNet VX2 dual radar system, water maker, a non-skid foredeck & Portuguese bridge deck, fiberglass hardtop, and a fourth control station located on the aft flybridge boat-deck. 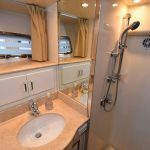 Interior accommodations includes a forward en-suite master stateroom with a island queen berth, a port VIP stateroom with twin berths and a third overhead bunk, and starboard stateroom bunk arrangement. 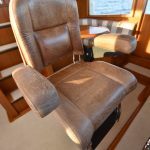 Entering from the aft cockpit deck you are immediately greeted with a capacious salon. 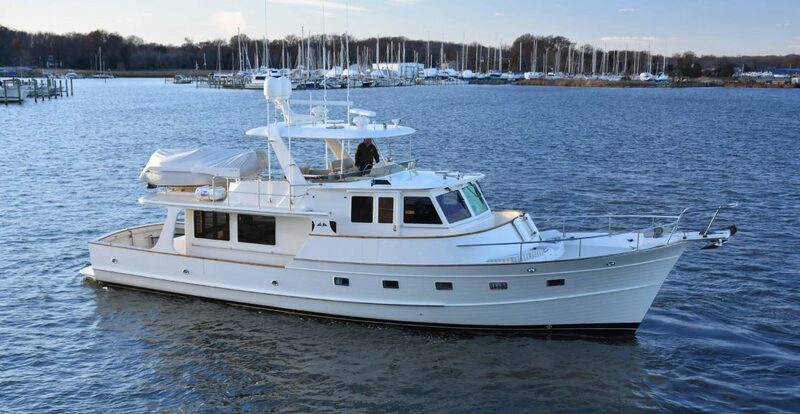 Featuring the timeless appeal of teak cabinetry, vast windows, teak sole with holly accents, and most importantly, an interior layout that balances form with function. 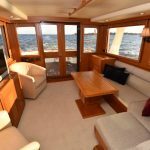 This layout allows for an open social environment while keeping the function of the galley separated from the rest of the salon. 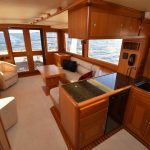 With a 16’ beam and spacious open floor plan encompassing the salon with the galley, entertaining guest becomes effortless. 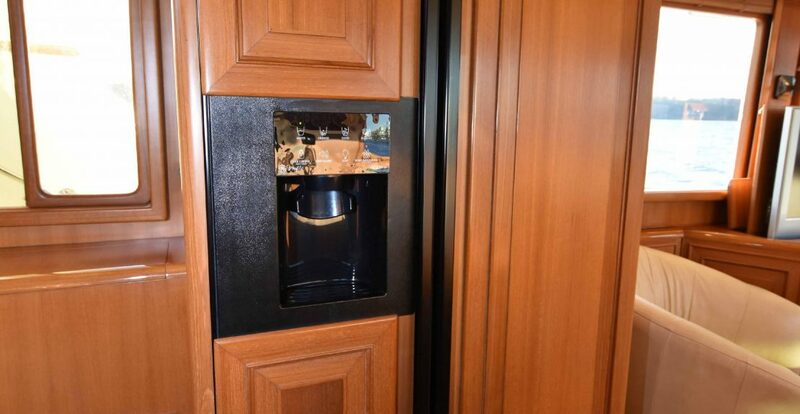 Starting at the aft-port side corner of the salon is a dry bar providing plenty of glass and bottle storage, along with hiding some of the salon audio equipment beneath. 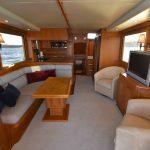 This bar anchors the large L-shaped settee that wraps along the port side around to the edge of the galley countertop. 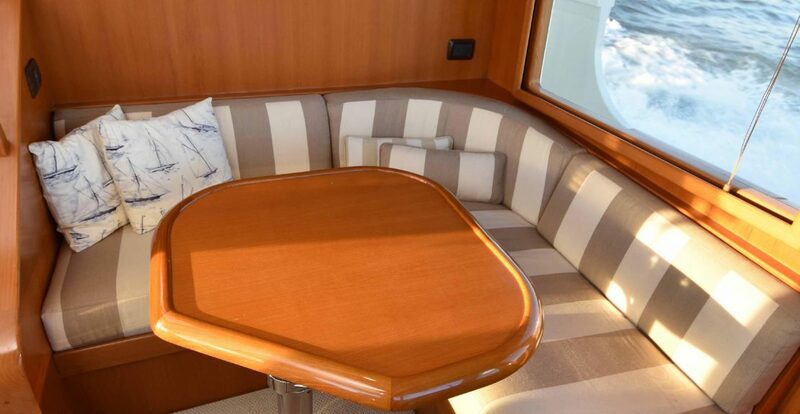 This settee, along with the twin chairs to the starboard side, provides comfortable seating for six in the salon and is complimented by a teak hi-lo table. 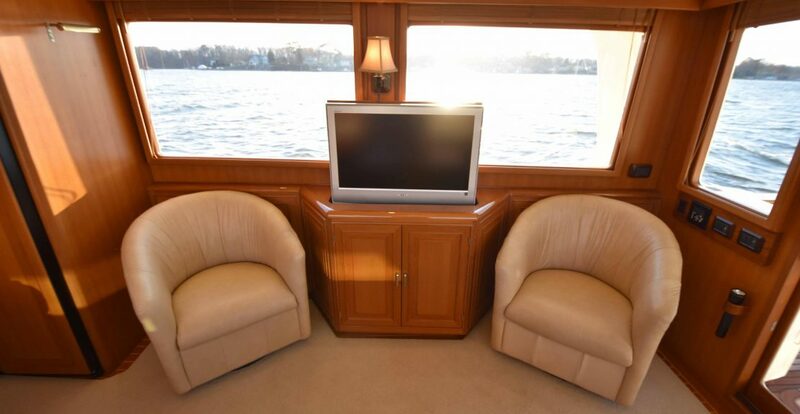 An entertainment cabinet is centered to the starboard side of the salon and features audio-video equipment custom fit behind a teak cabinet and a 32” Sony HD TV situated on a retractable TV lift. 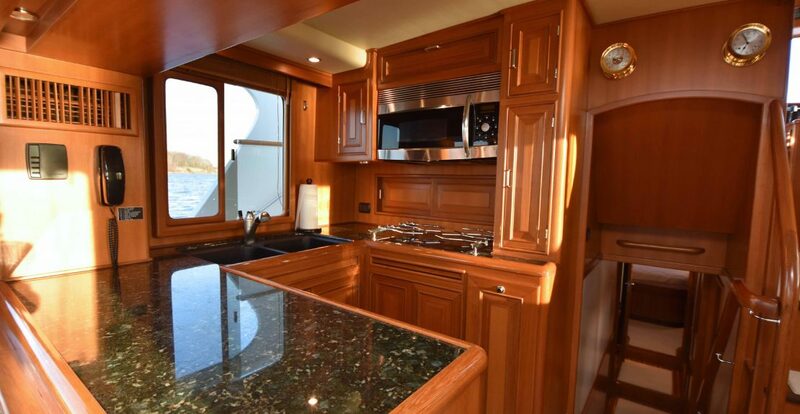 The galley is tucked to the port side just forward of the salon, which is separated by a large granite countertop peninsula and overhead galley cabinets. 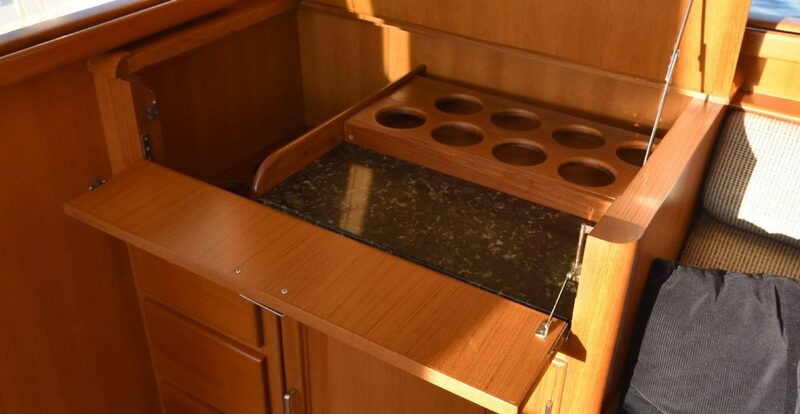 Within the inboard overhead cabinet is a dumbwaiter that can be accessed from a hatch on the flybridge. 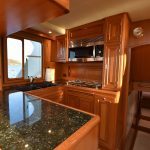 Wrapping around the U-shaped counter of the galley you will find a dishwasher, black silagranite double bowl sink, ceramic 4-burner cooktop with custom pot holders, and a convection microwave overhead. 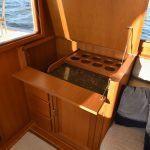 Teak cabinets fill in the rest of the galley including a storage compartments just forward of the cook top that can accommodate a full range of saucepans. 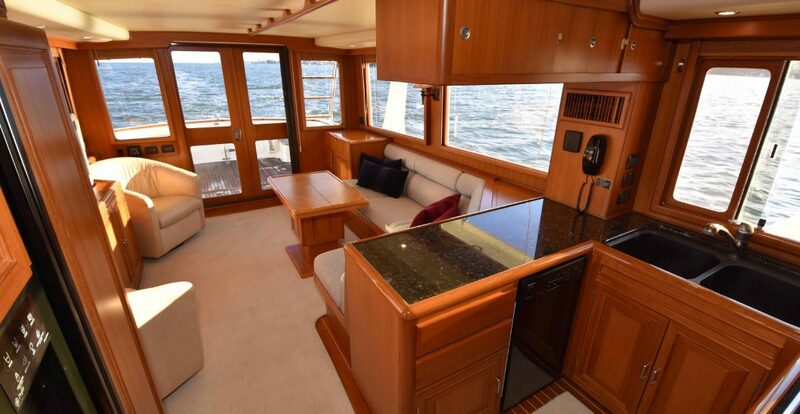 Across to the opposing starboard side is a dish storage compartment, additional storage drawers, and full-sized side-by-side teak faced refrigerator. 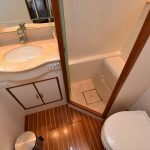 Following the five short steps straight down from the salon will lead you to the central passage of the accommodations. 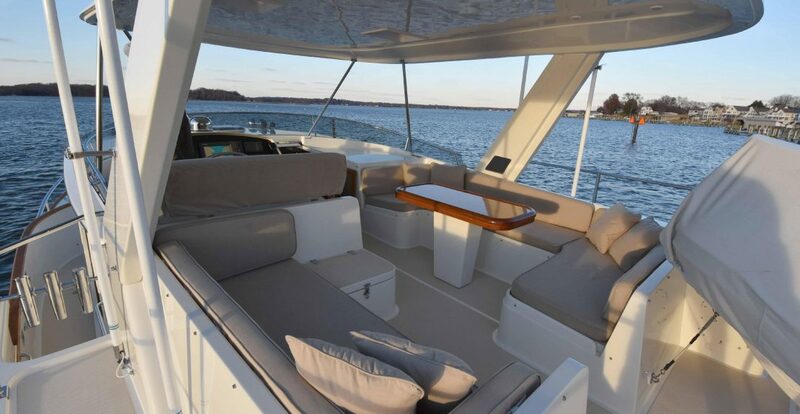 This traditional layout has been a signature mainstay in the Fleming 55 and provides an easy and convenient flow of traffic throughout the boat. 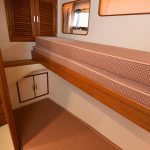 The central accommodations passage also makes it possible to appreciate the full length of the vessel from forepeak bulkhead to transom. 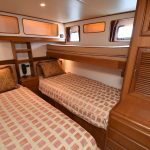 Once in the passageway you will find a two-berth bunk arrangement in the guest cabin to starboard along with a VIP guest stateroom to port with two twin-sized berths and a overhead third bunk. 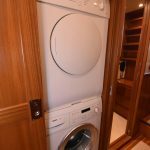 Just forward of the starboard side guest stateroom in the passageway is a full-sized Bosch Axxis 220v washer & separate dryer followed by the guest head. 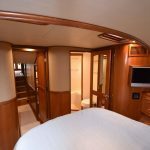 The en-suite master stateroom with a island queen berth tops off the accommodations at the forward peak. 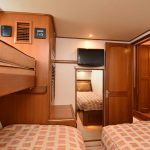 The master stateroom is composed of a queen sized island berth surrounded by shelves, cabinets, drawers, and his & hers hanging lockers to each side. 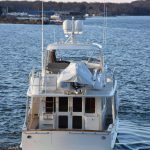 The island berth arrangement allows for access from either side and the berth can be raised via gas-assisted struts to access a large storage cavity underneath. 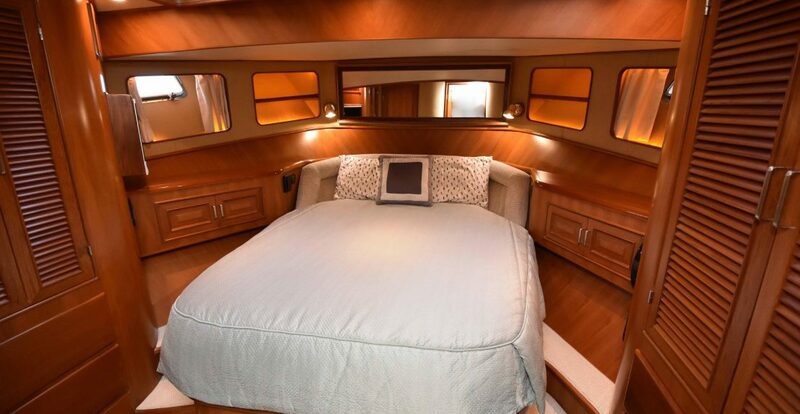 This storage cavity features a custom locking gun rack and is perfect for storing extra bed linens or keeping valuables out of sight. 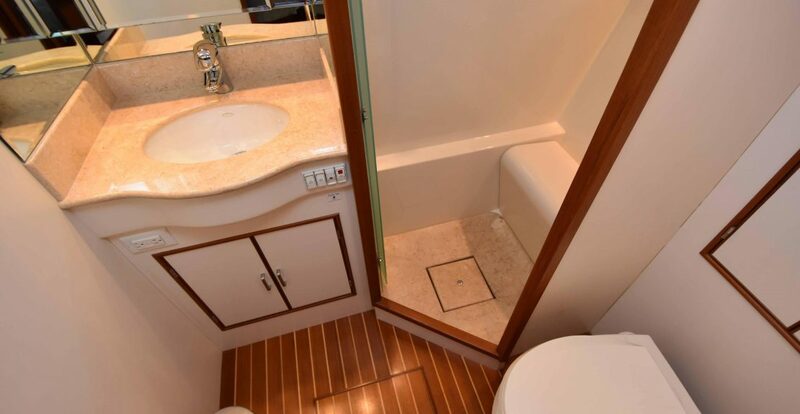 Over head are two skylights which, along with port holes, provide natural light to the cabin. 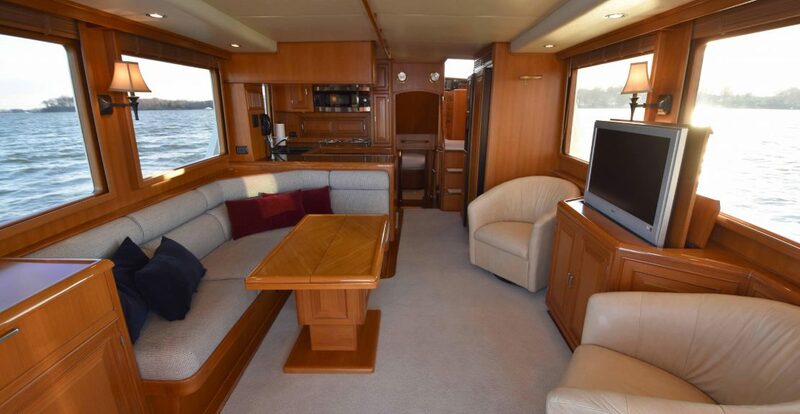 To the port side is a wall-mounted 15” TV and access to the en-suite master head. 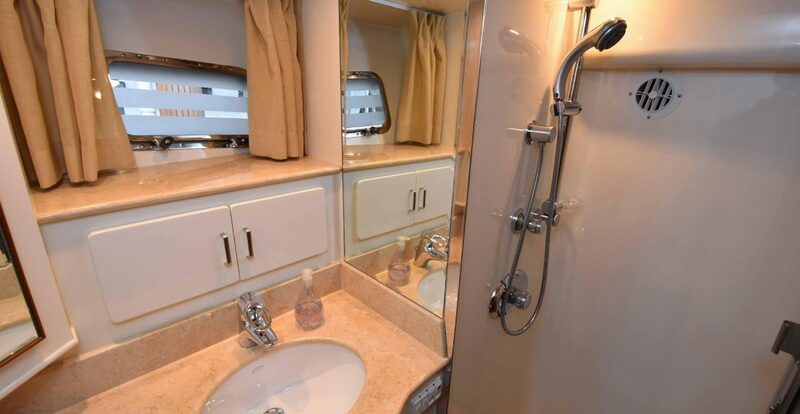 Both the master and guest heads are exceptionally spacious and feature one-piece molded fiberglass shower stalls with granite drain floors and glass doors, mirrored vanities with Hansgrohe fixtures, and granite countertops. 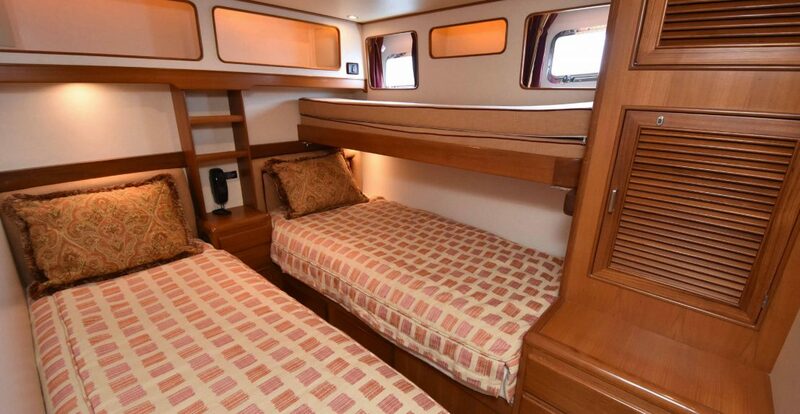 The port stateroom features two twin-sized berths along with an overhead bunk that can slide in towards the outboard wall when not in use. 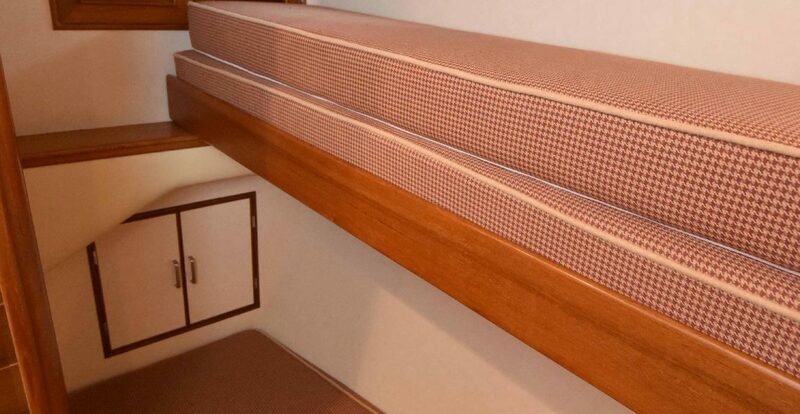 Separating the twin berths is a nightstand which provides storage in combination with the shelving found overhead and drawers below each berth. 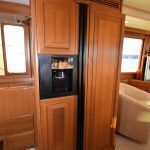 Additional storage can be found through the dresser drawers and hanging locker at the foot of the outboard berth and 18” flat screen television is mounted to the forward wall of the stateroom. 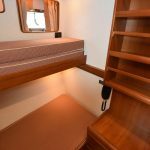 The starboard stateroom features a bunk arrangement and a variety of storage options via cabinets, shelves, drawers, and a hanging locker. 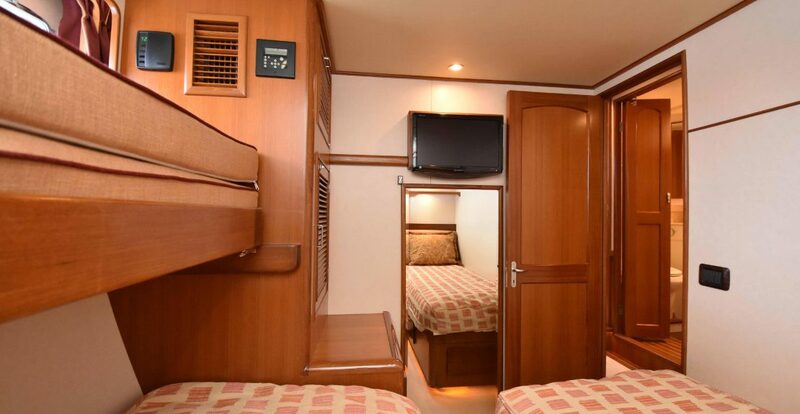 The overhead berth can slide away when not in use to provide more space for a single guest. 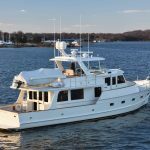 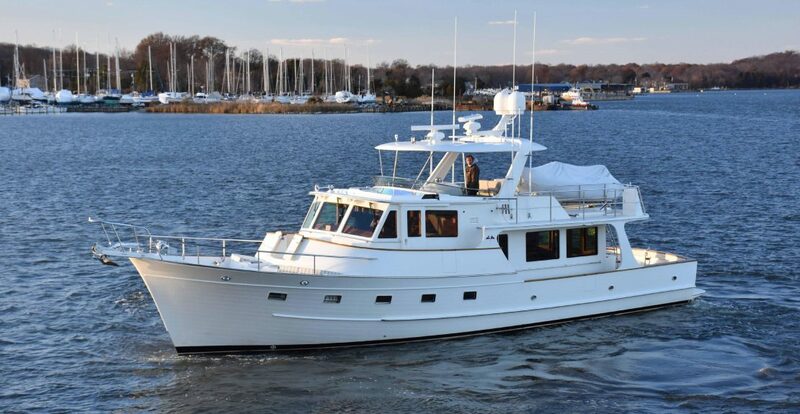 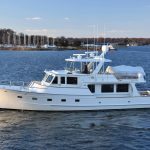 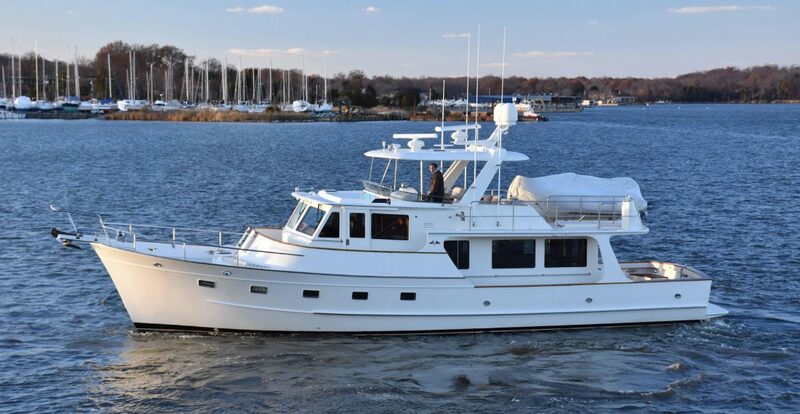 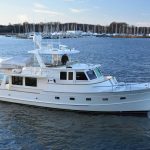 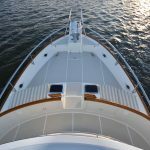 In many modern yacht designs it has become commonplace to eliminate the inside steering station, however the Fleming 55 features a dedicated pilothouse which closely resembles the bridge of a much larger vessel. 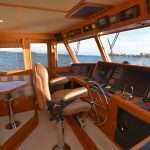 This dedicated pilothouse takes the role as the primary location to control the boat without any distractions from other on-board activities. 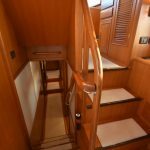 With that said it remains only three short steps up from the salon & galley and it is only another four interior steps up to the flybridge. 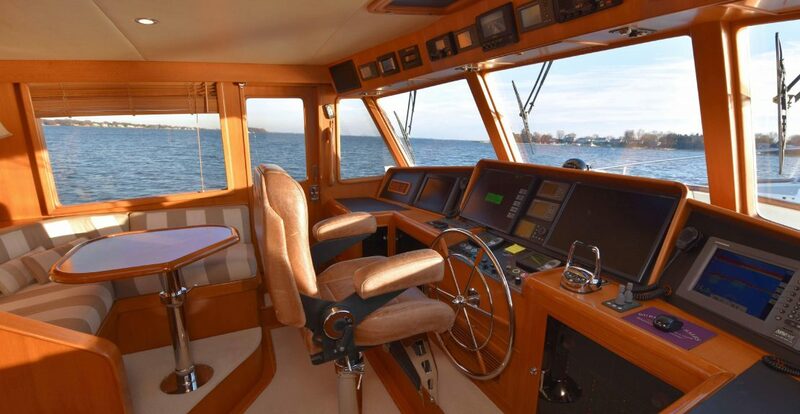 Visibility forward and wrapping around to port and starboard windows is excellent. 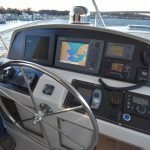 Below the expansive windshield are consoles which provide ample room for a full range of modern electronics and equipment without intruding on the engine instrumentation. 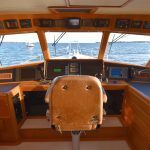 Overhead consoles provide additional space for equipment within easy reach. 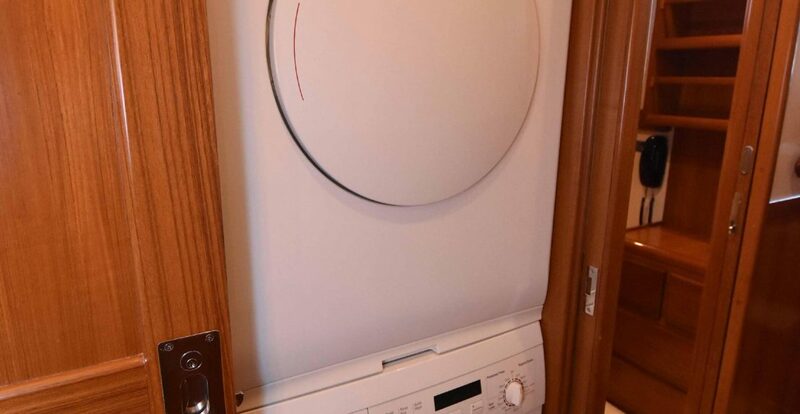 Both AC and DC electrical breaker panels are below the console to either side and can swing out to provide access to wiring connections and backside of displays. 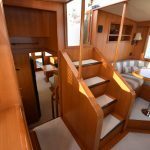 There is a proper chart area to the starboard side with large drawers for maps, cruising guides, navigation instruments, binoculars, and other necessities. 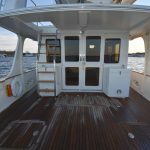 Centered along each port and starboard side of the pilothouse are sliding doors that lead out to the side Portuguese decks. 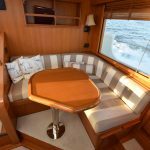 To the aft of the port side-door resides a raised L-shaped settee and table which provides a comfortable social area with phenomenal visibility while underway. 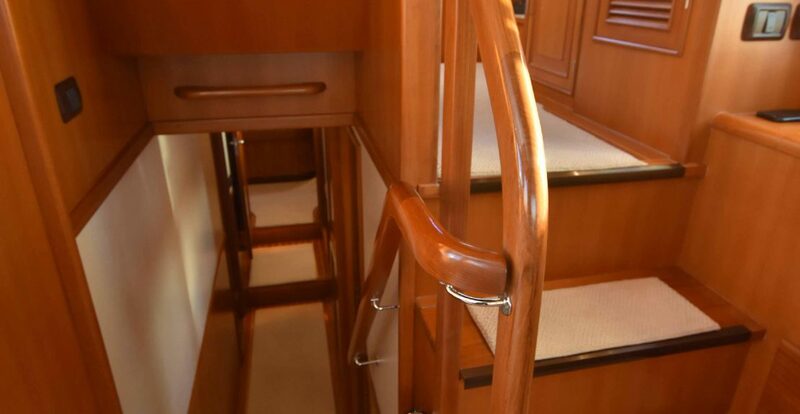 Aft of the starboard side-door you will find additional storage through a hanging locker and extra drawers. 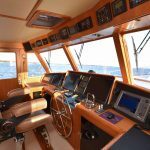 A large stainless steel destroyer wheel and Stidd helm chair finish off the pilothouse and perfectly accent this ultimate cruising yacht. 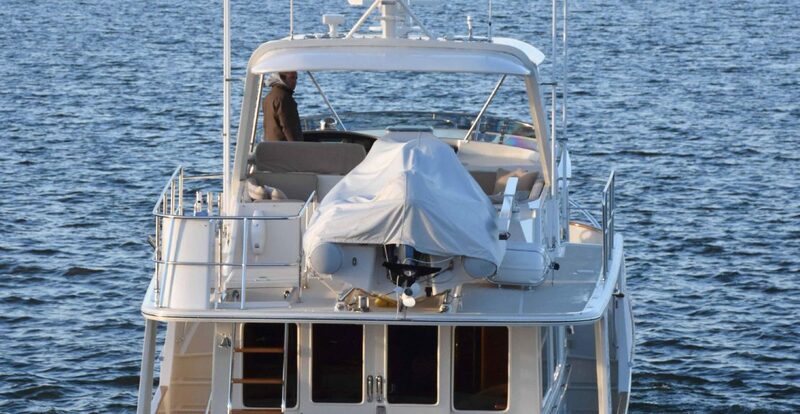 The flybridge is easily accessed from the interior steps in the pilothouse or by the ladder from the cockpit. 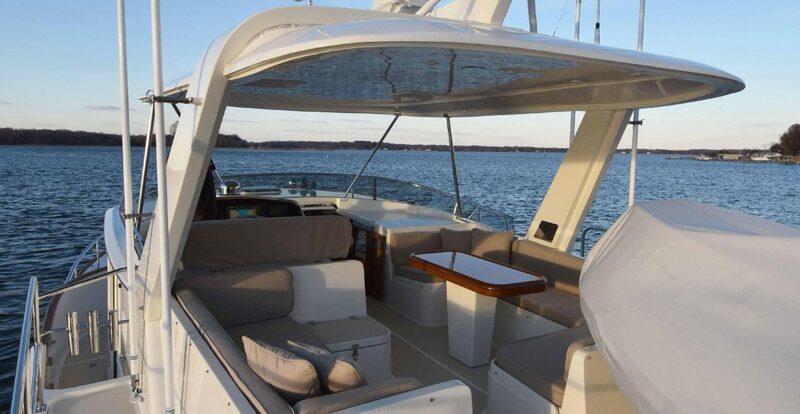 It features a two-seat upper helm station located to port that provides excellent visibility particularly in close quarters and bustling harbors with its 360 degree view. 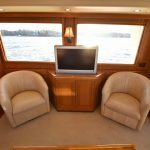 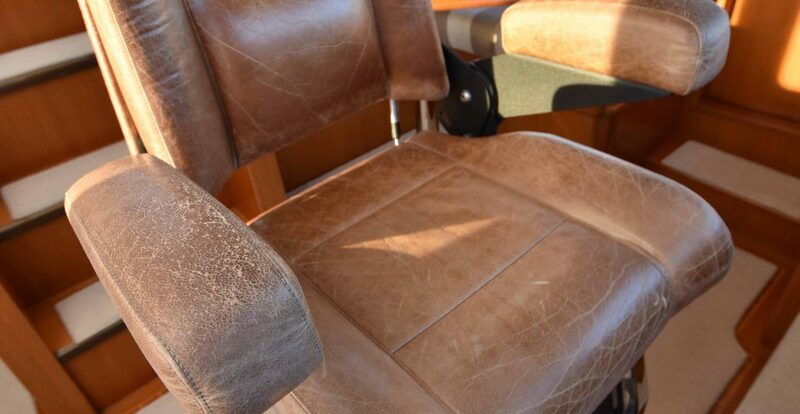 The electronics console is large enough to house an array of equipment with easy access to the rear of the console available by hinging open the bookshelf behind the pilothouse settee below. 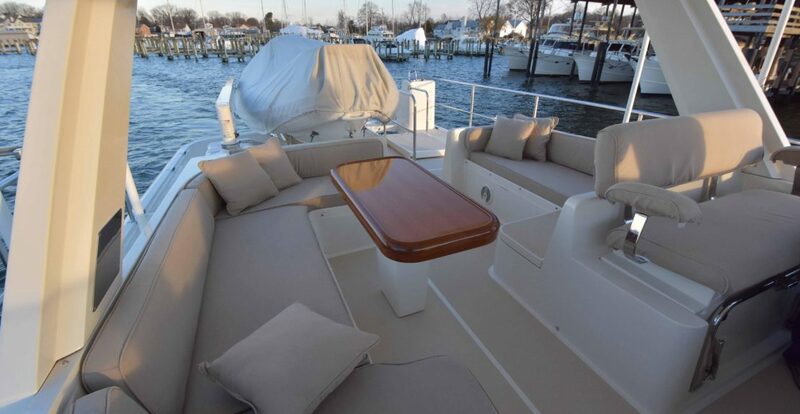 The starboard side of the flybridge features a U-shaped settee and a fixed fiberglass table with a removable teak top. 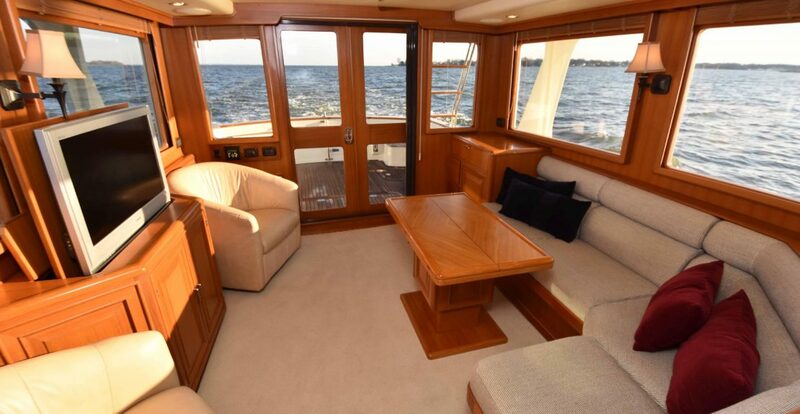 Aft of the helm on the port side consists of the hatch for the galley dumbwaiter followed by an additional settee. 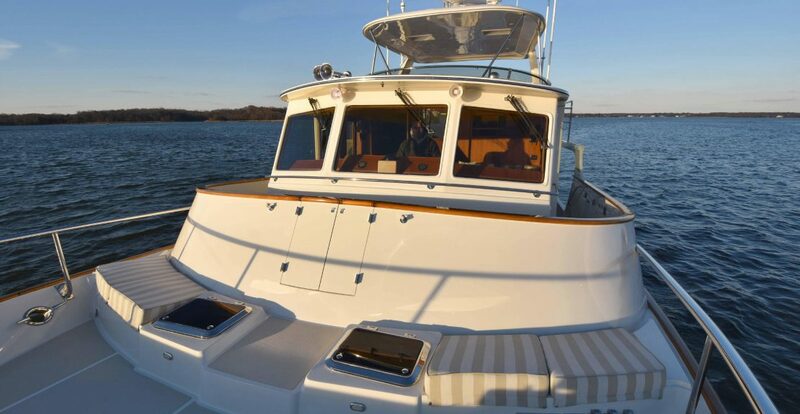 The following aft boat deck features a Steelhead 1,000 lbs hydraulic davit, Nautica 12’ RIB tender on mounted tender chocks, and a Switlik 6-man life raft to starboard. 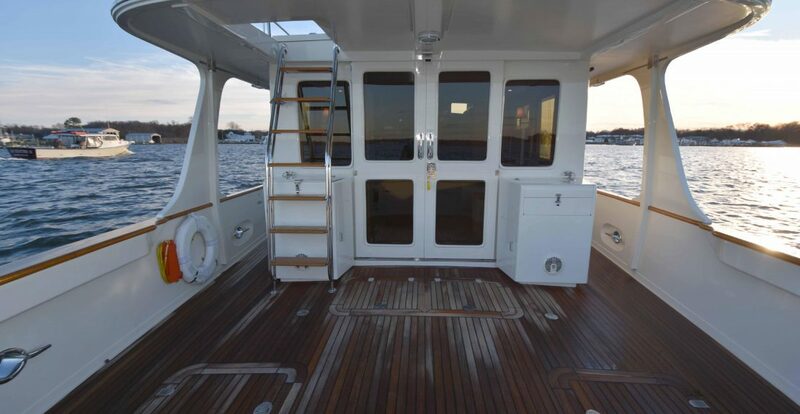 The hatch and step ladder to the cockpit resides to the aft port side, along with the aft control station. 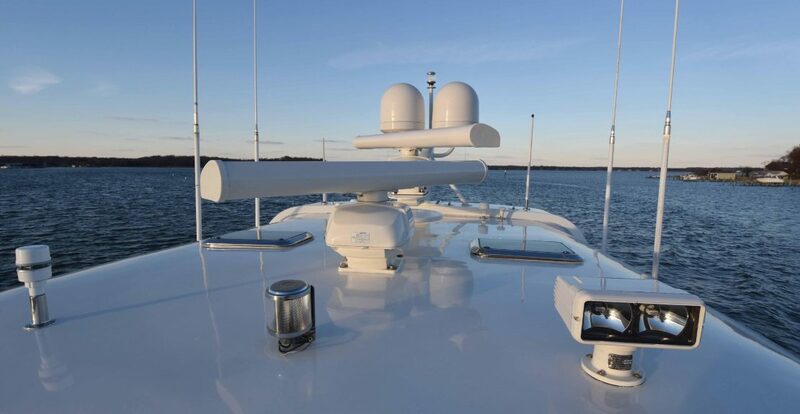 Overhead, a custom fiberglass hardtop with stainless steel supports is attached to the radar arch which in turn supports the custom mast, domes, and open array. 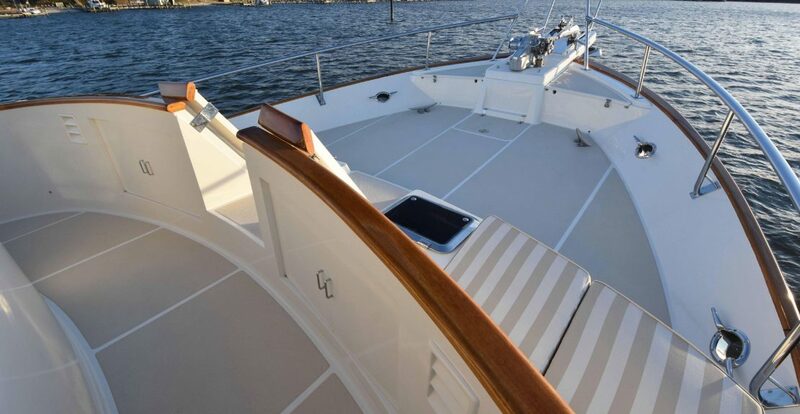 In common with all Flemings, the hull is hand laid and solid fiberglass reinforced with a grid of stringers and frames. 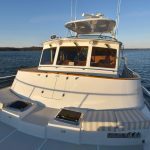 Vinylester resin is utilized below and above the waterline on the hull with further protection provided by epoxy barrier coats. 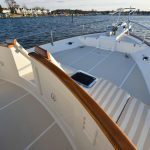 A reasonable five foot draft allows for Bahamas cruising while ensuring that the running gear is protected by a full-length keel which is foam filled and glassed across the top to isolate it from the hull. 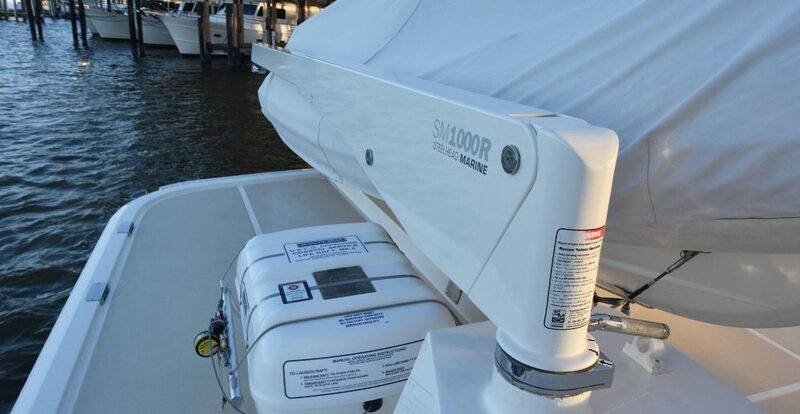 This keel provides nearly a foot length of protection before the running gear. 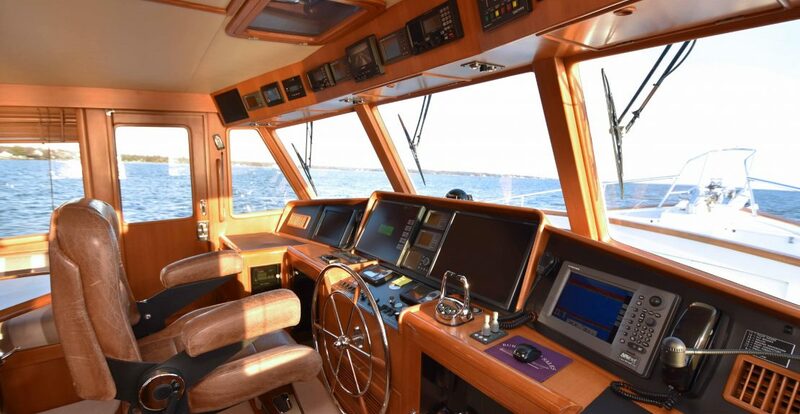 On deck she has the mainstay walk-around decks and in combination with high bulwarks and a Portuguese bridge, security for both children and pets is ensured. 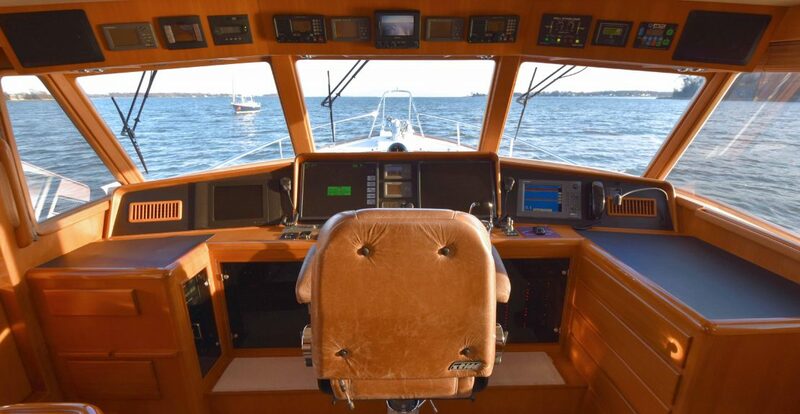 The foredeck & Portuguese bridge are non-skid while the cockpit deck is composed of natural teak. 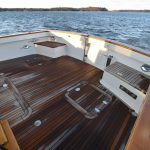 All of the cap rails, trim, and coaming boards throughout are varnished teak. 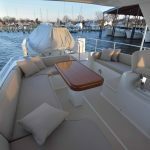 The cockpit features a control station located starboard of the salon doors while additional storage and a stainless steel lined icebox is to port beneath the step ladder that leads up to flybridge. 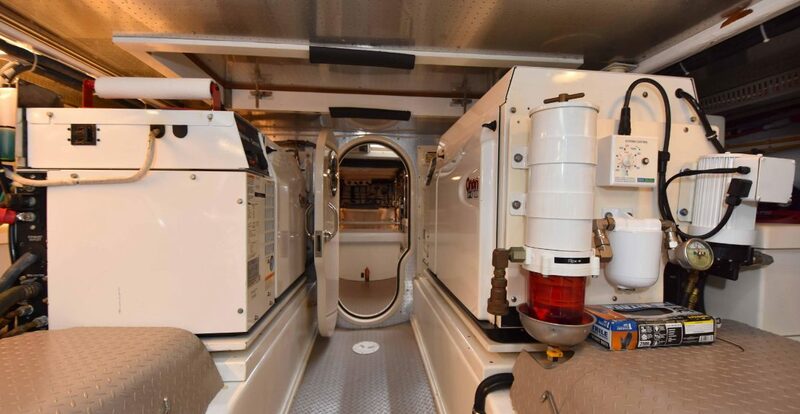 On the cockpit deck are four gasketed and lockable hatches that provide access to the engine room and spacious lazarette. 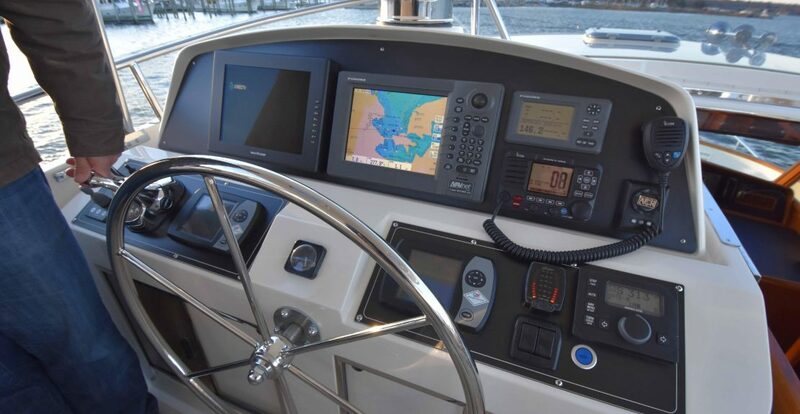 The transom of the cockpit features a large gate that swings in to allow ingress to the swim platform. 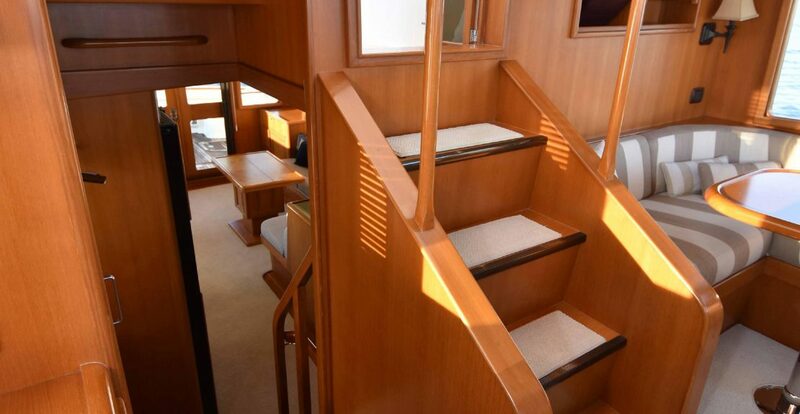 Moving forward along the side decks you will discover entry gates on either side of the cockpit side decks. 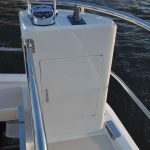 These gates provide lower entry close to the water line, meanwhile additional gates on either side of the raised Portuguese bridge give the option for a higher point of entry. 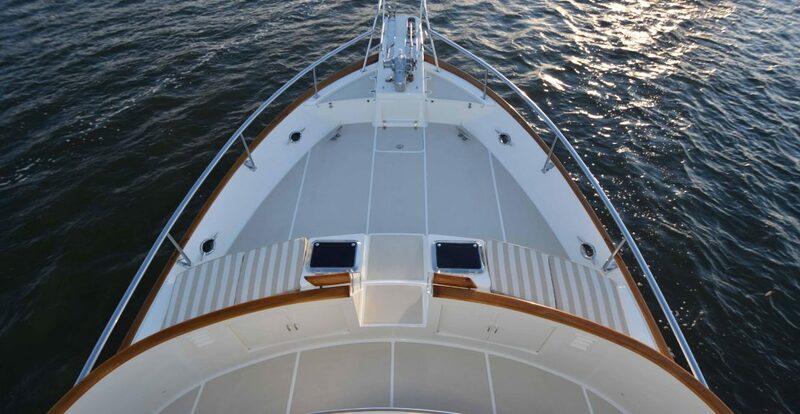 Up to the bow will bring you to a non-skid foredeck with stainless steel handrails. 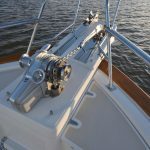 Special attention has been paid to the ease and safety in which the heavy duty ground tackle is set and retrieved. 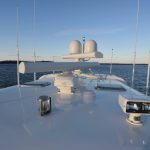 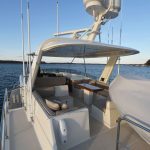 The anchor platform accepts two anchors, each of which can be controlled by a handheld unit at the platform or by controls at both the pilothouse and flybridge helm stations. 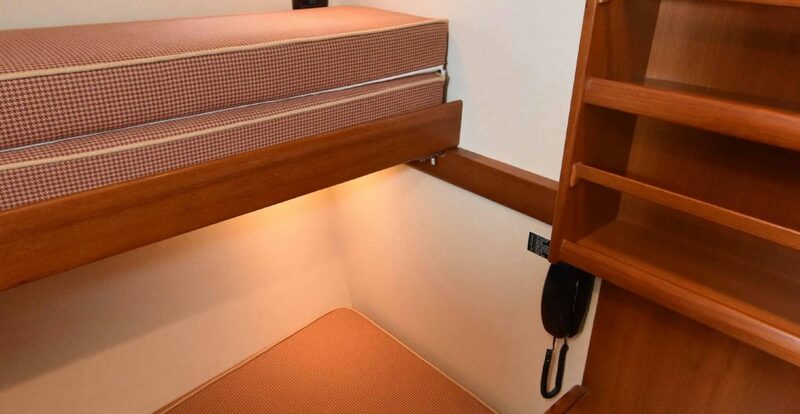 The anchor locker directly beneath the pulpit can serve as a great place for fender storage as well. 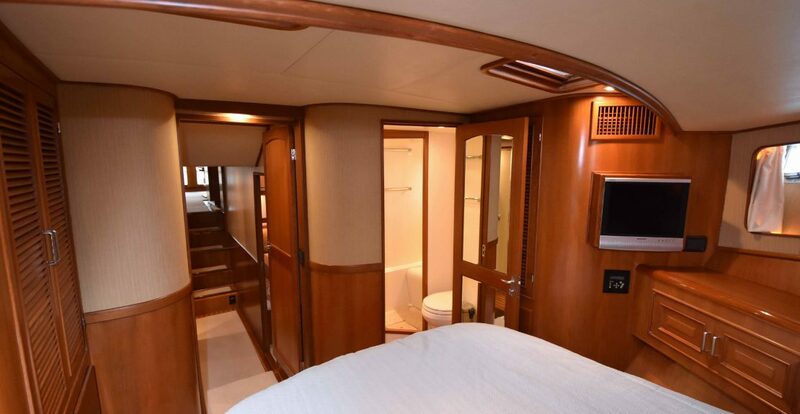 Furthermore the inside wall of the Portuguese bridge includes two storage cabinets that give convenient storage for dock lines, windshield covers, and cleaning supplies. 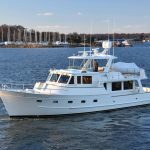 Superior systems and engineering are key elements for Fleming Yachts, whose philosophy has always been to choose only the best equipment available and have it be readily accessible for maintenance. 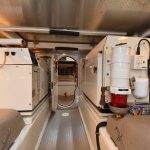 The main engine room access is from two outside hatches just aft of the salon doors. 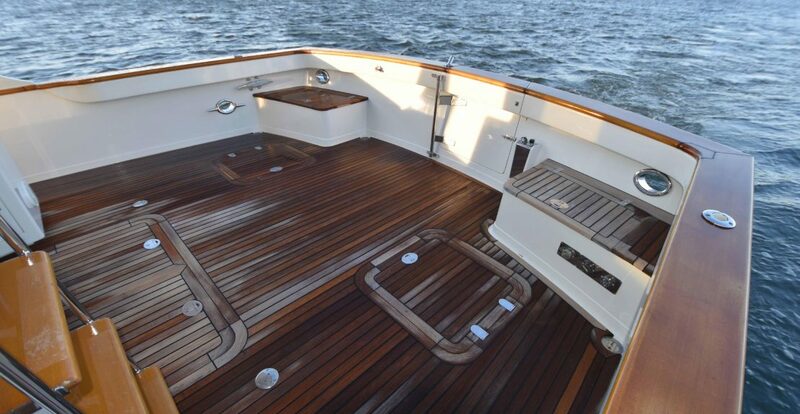 The salon floor panels can also come apart for greater access to the engine room when needed. 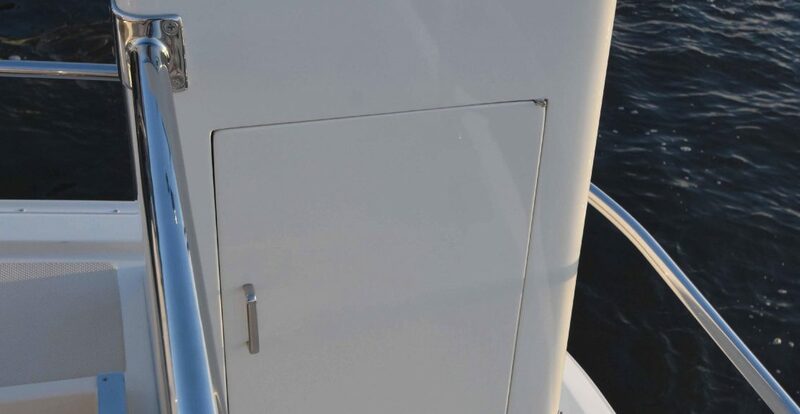 Air intake for the engines is accomplished through openings underneath the cockpit coaming boards which then travels through the lazarette and then to the engines thus allowing for less salt to come in contact with the engine components. 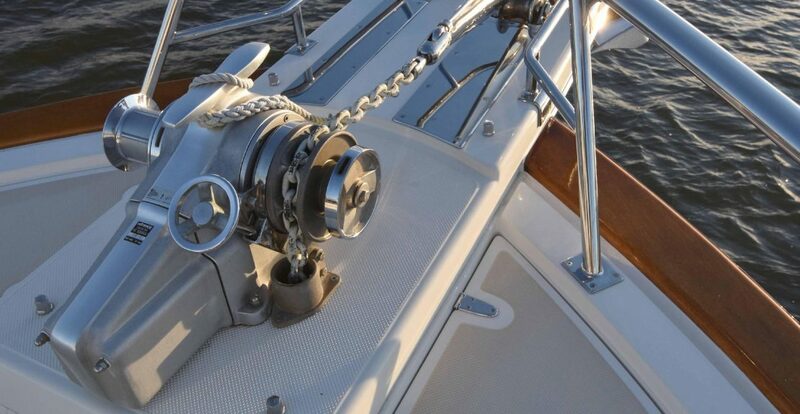 To achieve the extremely low sound and vibration that Flemings are known for, Aqua-Drive thrust-bearing systems transfer the thrust directly to the hull and the engine is isolated by using soft engine mounts. 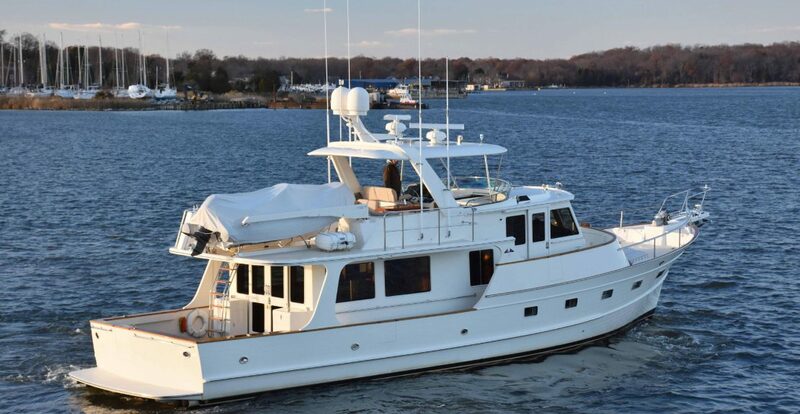 Aft of the engine room, the lazarette houses the water tanks, steering gear, and air conditioning compressors while also leaving ample room for storing cruising gear such as deck chairs, spare anchors, rode, lines, fenders, and extra parts. 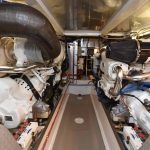 Having the air conditioning compressors located here instead of in a hot engine room improves performance and efficiency while minimizing noise. 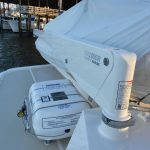 Additionally, all battery isolation switches are accessible from outside the engine-room.